My posts have been very veggie of late. So much so that my last non-vegetarian recipe was shared over a year ago. Strictly speaking though I’m not vegetarian, but ‘pescetarian’. That’s because despite living happily without meat (and feeling better for it) I’m still having fish once or twice a week for the health benefits. Fish is known for being one of the top sources of omega 3s. These fatty acids have so many proven health benefits that I’m not even going to try to list them here. Omega 3s are one of the reasons why the (rich in fish) Mediterranean diet is admired for its ability to promote good health and longevity. When it comes to fish however it pays to be fussy. I say this because farmed fish is often raised in unpleasant crowded conditions that bear no resemblance to a natural habitat. Wild-caught fish by contrast is a more ethical choice, boasts a superior nutritional profile and is less likely to be contaminated. Some of the best omega 3 packed wild-caught fish is readily available on supermarket shelves – in the form of canned sardines, anchovies and red salmon. These three types of fatty fish are also low in mercury – another bonus. If you’re keen to learn about about the healthiest choice when it comes to fish check out this article from Doctor Mercola. Those of you who don’t eat fish possibly won’t make it this far into my post, but if you do then consider making this pie vegetarian by replacing the fish with mushrooms or cannellini beans. And if you’re vegetarian or vegan it’s worth knowing that chia seeds, flax seeds and walnuts are plant-based sources of omega 3s. I mentioned that my last non-vegetarian post was back in June 2016 – ironically it was an earlier version of this pie. 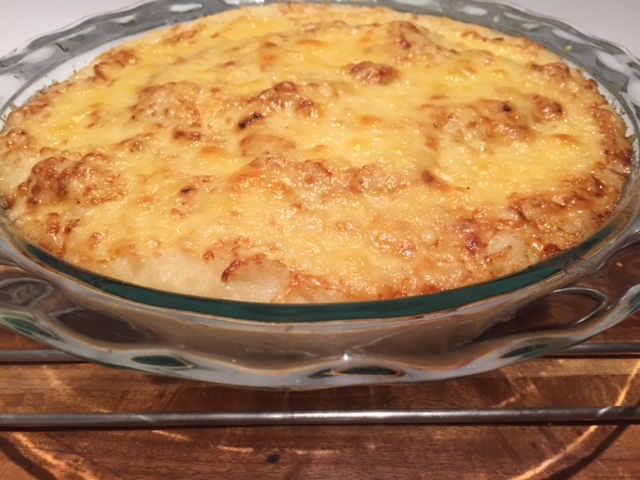 With Winter arriving in Sydney and cauliflowers back in season the timing was perfect for a hearty but very healthy fish pie. 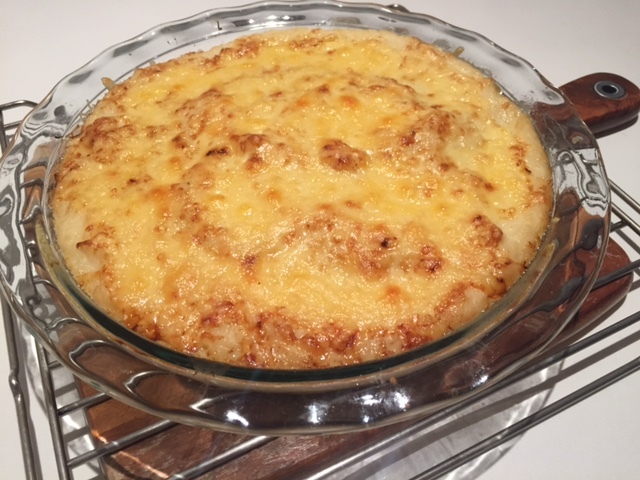 My top pick fish for this pie is canned Alaskan sockeye salmon – Alaskan sockeye is a great choice of salmon because isn’t allowed to be farmed and so you can be confident that what’s in the can has been wild-caught. The higher price tag relative to other canned salmon also speaks to its superior quality. This pie is super flexible – you can experiment with different types of fish, greens, herbs and even toppings. I’ve detailed my preference below with good alternatives in brackets. Enjoy! For the pie filling finely slice the leek and garlic. Heat the butter in a saucepan and add the leek and garlic and cook until soft. Then add the peas and mustard and also the (optional) wine. Simmer for a few minutes then turn off the heat. Once cooled mix in the finely flaked fish and chopped dill. For the pie topping chop the cauliflower into small pieces and then steam (or boil) until soft. Once cooled blend it into a smooth puree adding the yoghurt and some salt. Add the filling into a pie dish and cover with a smooth layer of the topping. Grate over a little cheese. Bake in the oven for 30 mins at 180C. Tags: cauliflower, fish, pie, salmon. Bookmark the permalink. Great recipe, Laura and I particularly liked the tip in relation to canned salmon. I will be on the lookout for the one you’ve recommended. And cauliflower is one of my favourite vegetables, one of the wonders of the winter season! Think I’ll have to make this pie. Thanks Tracey and yes not only is canned salmon a great choice if you choose the wild red salmon – it also works out much cheaper than from the fishmonger and can always be on hand in the pantry! Great recipe, Laura. And I particularly like your tip in relation to the canned salmon – I will be on the lookout for the one you’ve recommended. Cauliflower is one of my favourite vegetables – one of the wonders of the winter season. Think I will have to make this pie. Yum! This looks delicious and healthy, and I agree with Tracy – I love the tip about the canned Salmon! I have a friend who would love this, I’m passing your recipe to her! Thanks Nell and yes canned salmon is so underrated – just be sure to choose the red variety instead of pink….. This sounds amazing, Laura. I think the canned salmon (higher price tag or not) is a great budget way to go. I’m always looking for ways to use it beyond the ubiquitous salmon “loaf” which I grew up on. Great recipe and informative post! So true! A lot of people are just afraid of it! What a yummy combination of flavors, Laura! I love fish (tho I don’t cook it at home much) and your pie looks absolutely delicious!! You’ll enjoy this then Hungry Mum – my top pick herb to use is dill and a good dose of white wine makes all the difference too!